We pick our apples fresh off trees we have access to. We use an apple peeler that peels,cores and slices the apples for me! 4.) Slice apples evenly, 1/4 inch is ideal. You can also use a mandolin or jerky board to slice and achieve even slices. 5.) To avoid browning to your apples soak in lemon water, 1 cup lemon juice per 1 gallon of water. THIS STEP IS NOT NECESSARY. 6.) 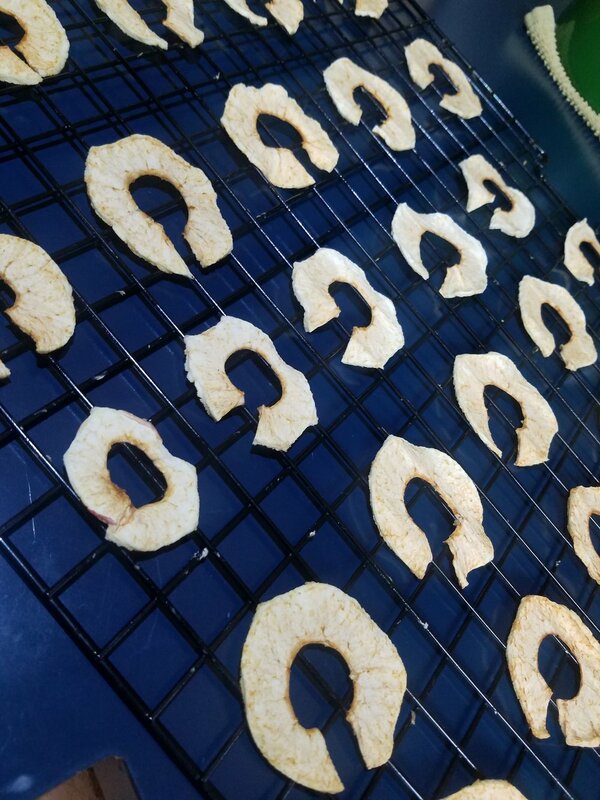 Place your apple rings on your dehydrator trays leaving about 1/4 space between rings. If you soaked your rings remove as much water as possible before placing on trays. 7.) Sprinkle a light dusting of cinnamon ove true top of apples rings. THIS STEP IS NOT NECESSARY. 8.) Place in dehydrator and dehydrate at 135*F for 8 to 10 hours. You want to check the apples for moisture. Rings should be leathery and feel dry, they should not feel tacky. Store in an airtight bag in a cool dark place. Our dehydrated apples don't last more than a couple days.